Pediatric chiropractic is a safe, gentle and efficient way of restoring health to children through precise nervous system analysis and adjustment. Less-than-optimal nervous system function is frequently the cause of many of the health issues that we see kids struggling with today. Some dysfunctions, ranging from ADHD and autism to ear infections and seizures, are now at almost epidemic levels. Chiropractic care is on the frontier of advanced technology in helping little ones thrive. Ongoing research and analytical studies have made our gentle treatment the sensible choice in wellness care for children. Several years ago, Dr. Tony’s 3-year-old cousin Jace was having severe health difficulties, including asthma. The little boy was on five medications, had to endure frequent emergency room visits, and was unable to play with other children. His mom brought him in to see her chiropractor cousin, and the remarkable recovery he made through pediatric chiropractic care changed not only Jace’s life but Dr. Tony’s as well. Our mission is strong and unwavering: we want to help sick kids get well, and to prevent children in our community from becoming just another statistic. Our goal is to bring out the wellness potential in every child that enters our clinic, so that they, too, can have a turnaround like Dr. Tony’s little cousin. Today Jace is off of all medications, free of breathing issues and on the swim team. Because of our exceptional track record in helping children, our clinic has become a destination spot for families seeking help for their kids. 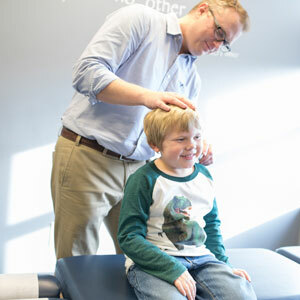 We’re the largest pediatric-focused chiropractic office in northwestern Ohio, and we’d love to be able to help. Contact us to book an appointment with pediatric chiropractor Dr. Tony Morman; you’ll find that our care is affordable and heart-centered.